Maybe you’ve pondered the choice while leaning over your bowl of steaming Ramen. 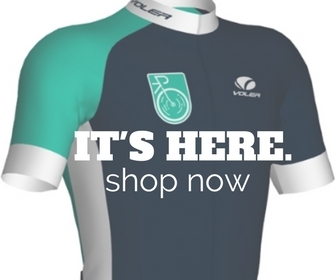 Your eyes fixed on the sleek, aero lines of your road bike as you calculate the price difference between a month’s worth of those salty noodles and two weeks of PB&J. Just how thin will your food budget get before you can add that sweet power meter to your rig? Start expanding your dinner options because the PowerPod gives you steady wattage measurements for just $300. Yep. $300. Upsides: Seriously inexpensive in comparison to other power meters, and easy to swap between bikes–especially if you’ve got two mounts. Power readings are consistent from ride to ride as long as you properly calibrate the unit with a warm-up ride. The Isaac software complements the PowerPod and gives you a ridiculous amount of analysis opportunities. Downsides: It takes a little time and finesse to make sure you have the system operating properly; although, this is also generally the case with every power meter. 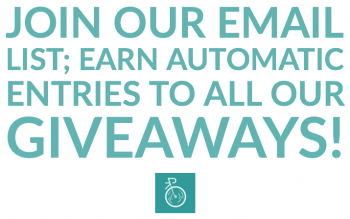 The calibration and pairing needs to be done correctly, so impatient riders may find themselves with some strange numbers. Also, no battery life indicator means you have to just remember to charge it after a couple of rides. Lastly, you may notice odd spikes in power numbers when riding over rough terrain or changing positions on the bike. So we’ve already established the fact that this little keeper of the watts is a good deal, but cheap won’t get you anywhere if it’s not accurate. I powered this puppy up in conjunction with my Quarq Riken R and Stages power meters to see how they all measured up. After reviewing the metrics on rides over the past few weeks, I’ve found that the Power Pod holds its own with other units with a few caveats. The PowerPod consistently gives higher numbers–not necessarily a bad thing when you’re sharing with your Strava friends, but you should be aware of it. Since really your training is set based on your own FTP, the fact that the unit is consistent should really be the only important thing. This should allow you to train with consistent numbers despite them being a little higher. But do be aware of the fact that you’ll want to re-calculate your FTP with the PowerPod if you’ve gotten your number from another unit (because I know all of you have a few extra PowerTaps laying around, right?). How much higher are we talking? Generally the PowerPod was 15-20w higher across the board than the Quarq and the Stages. But it was, as I said, consistently higher. That’s the key. The PowerPod has a little more setup to go through than most other types of power meters (unless you factor in installation time and hassle, in which it creams most other installs). Make sure that before your first ride you set aside at least an hour to get it all set up properly. Mounting to pairing–it all just takes a little time. The kit comes with some pretty detailed set-up instructions, which should explain most of it to you. When I first opened the box, I was slightly impatient, and I went to pair the unit to my computer without doing the whole setup deal. Consequently, I got frustrated when my ELEMNT wouldn’t find the PowerPod. Several “what the hecks” later I realized I hadn’t woken up the speed/cadence sensor properly on my bike. Dude. After that, the setup was fairly easy, and the 5-minute calibration ride got everything in order. But I did notice that the calibration ride needs to be smooth and steady or the PowerPod has a little difficulty leveling out. If possible, don’t stop or hit bumps. Easy, right? Riding here where the world is windy, I expected to see more inaccurate numbers when I rode near the ocean, but it seemed to stay pretty steady. The cool thing–if you’re a number cruncher junkie–is you can see the wind calibration in PowerPod’s companion software, Isaac. The Isaac software is really cool, and it tells you all kinds of info like wind speeds, coasting/braking/standing time, and wasted watts (great training aid), but the program lacks an intuitive interface. So, I opted to do my analysis on my usual software. Of course, you’ll need to use the Isaac software if you want to use the unit on multiple bikes, which is frankly one of PowerPod’s key features. You’ll need to set up profiles for each bike the first time you switch. If you only have one bike, you’re good to go from the box, but if you want to swap it you’ll need to pair it to the first bike, do the calibration thing, wait 20 minute for it to turn off (oh yah, there’s not actually an “off” button), then plug it in to Isaac. In the software, you’ll have to set up a second bike profile and do the whole pairing/calibration thing again with your second bike. The good news is, you’ll only have to do this once as the PowerPod will automatically select the proper profile based on which sensors it’s detecting from which bike. Important. Make sure you’re not blocking the wind opening. It needs this open and clear of obstructions to work properly. Also charge it before you think it needs charging. Because if it’s dead, you’ll just go to pair the unit and nothing will happen. Because it’s sitting underneath my bars, I didn’t really notice it enough to remember to plug it in when it was low on juice, and there’s no real battery life indicator (unless I’ve missed it). When it does need charging, it takes about 2 hours to get it topped off. So it’s a good idea to do this the night before every long ride, and definitely after every two-three rides. 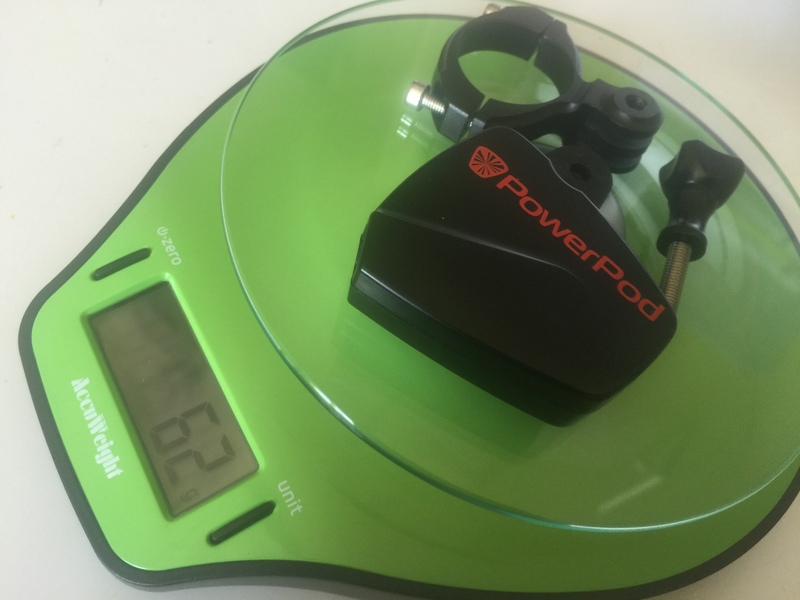 Overall, the PowerPod is a solid, good value tool for any serious cyclist. 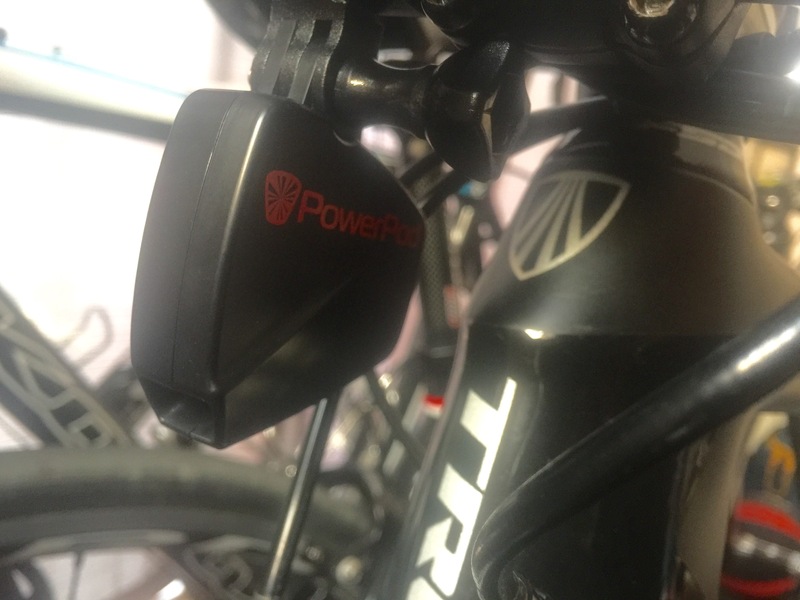 Although it does need a little more mindfulness to use it, and you may see odd spikes in wattage here and there, the PowerPod pretty well holds its own against power meters that cost a great deal more. The black is fairly stealth, and your friends will likely be pretty into oohing and aaahing over it. When going uphill, wind speed will decrease but power will increase, does that mean the device only work on flats? What about wind gusts? Hello Pierre! I tested this in a very windy area, and I didn’t notice any really strange power readings when going uphill or with wind gusts. It stayed quite consistent (compared to use with the two other power meters as a standard). Really the only spikes I saw were on bumpy roads–this would definitely not work well for a gravel/cross bike. Although the new versions may have worked out the kinks.